Email marketing is all about balancing individualized content. Your email needs to be engaging from the moment it is opened in order to keep your subscriber’s attention and stand out among other competition in the inbox. 1. Use a balanced approach. Balance text and image content in your email. Avoid making your email one big image because spam filters tend to flag this. Design on a grid with single column layouts—think “inside the email box”. Evenly distribute text and graphics within the email so that there is tangible content that goes along with images. Most email clients block images by default so make sure any images in your template have ALT tags that help the subscriber realize you have images to download. Consider adding a colored background area behind images so that when images haven’t downloaded it looks like there should be something there. All of your subscribers are on multiple email marketing lists. They have a limited amount of time to read through your email. Keep reading content short and link off to your website or other digital properties (Blog, YouTube, Facebook, etc.) when more content is necessary. Minimize scrolling and keep any primary calls to action above the fold. Add interesting and engaging content to your emails with videos and animated gifs. Use WordFly’s video in email feature to stream videos directly in email clients that support it. Include animated gifs to add motion and visual interest. Just keep the opening graphic static to ensure something displays in email clients that don’t support animated gifs. Use Data Fields and Dynamic Tags to add first name personalization to your emails. Small amounts of personalization show you are connected to your subscriber. 5. Send in Multipart-MIME format. Multi-part MIME format bundles your text and HTML email into one package and sends both versions to subscribers. Subscribers only receive the email format that their email client preference is set to receive. Every email is built upon three primary sections: Pre-header, Body, and Footer. When you are designing your email break each section out and be deliberate about each section's design. Help move your reader through the email with a balanced flow. Let's review each section as it relates to WordF's Modern Editor email template builder. 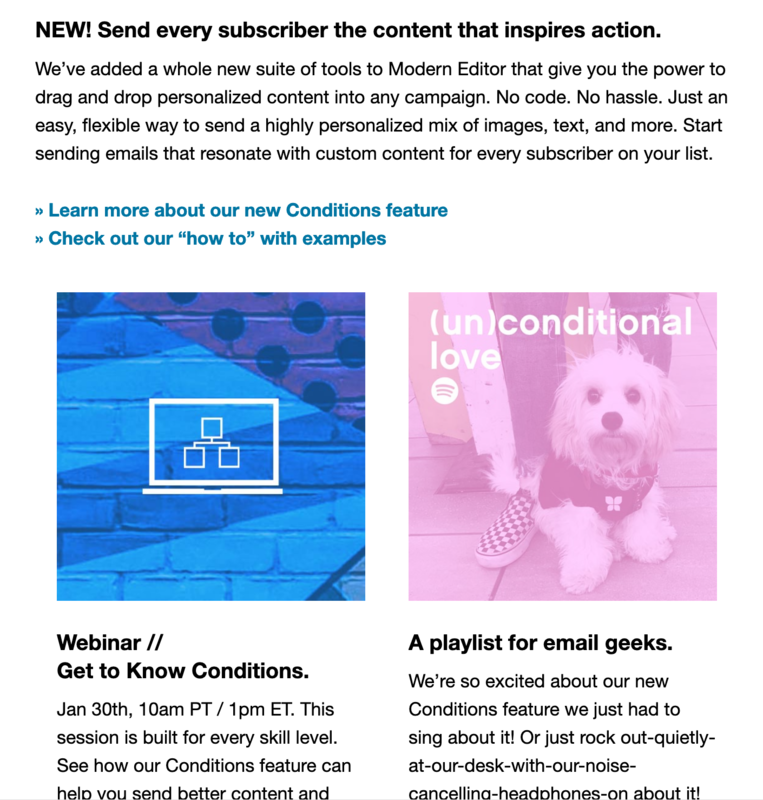 The pre-header is the first glimpse of the content in your email after your subject line. Use this space to reiterate your main offer or content. Place content messages to the left for the best visibility. This space is also used often for “view email as webpage” links and requests to whitelist your From/Reply to Name. The first part of the email body is typically a headline or graphic header (hero image). This part relates to the content in the email and isn’t so large that it dominates most of the email. The rest of the body includes sub-headline(s), smaller images, copy, links, and calls to action. The key in the body is to keep content short and drive subscribers to get more information on your website or blog. This is like the admin area of your email. Include your unsubscribe (required!) and preference center links in this area, as well as your organization name and address. You are required by law to have these in all of your emails. Use this area for other things like social media connections, terms and conditions, or a paragraph explaining why the subscriber is receiving emails from your organization. Now that we've covered what makes a great email, let's show you what great looks like because, let's face it, emails with beautiful, intentional design receive the most attention from subscribers. Check out our Email of the Month picks for design inspiration!